Automated One Call inquiry ticket screening, workflow and response management solution. Preventing damage to utility infrastructure involves more than responding to a One Call ticket. TicketAccess enables Utilities to automatically screen One Call tickets, assess the risk and workflow appropriate communications to operations and the contractors working near critical infrastructure. Get ahead of the work and instantly start the communications to increase awareness and reduce damages. Via the TicketAccess screening processes a utility can reduce the costs of locating via sophisticated GIS and workflow based business rules. Respond automatically to the One Call inquiry and the contractor with custom messages indicating the presence, type and location of facilities affected by the ticket. Cheaper for you. Cheaper for your clients. Remove the manual steps of reviewing, managing and distributing tickets from the hands of valuable staff, allowing for re-allocation of hours, better spent directly communicating with contractors to ensure safety of their crews and the utilities assets. A risk scenario is then used to determine how and where communications are delivered to nominated systems, groups or individuals to action. Spatial queries can be configured to support workflows and response business rules. 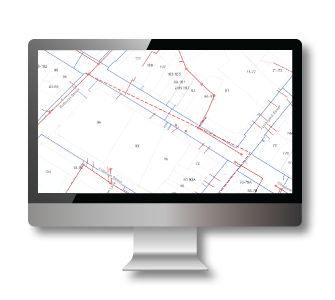 Ticket and location information can be shared with utilities GIS system(s) to support regulatory reporting requirements. Automate escalation rules to assist in the control of large tickets and how contractors should interact with your team. The team at Greater New Haven Water Pollution Control Authority explain how through the use of TicketAccess they have seen a significant reduction in the resources and time required to review, respond to and mark out CBYD 811 tickets. Contractors receive an automated response within minutes of submitting their CBYD ticket indicating the presence of underground facilities and then outlines the actions by GNHWPCA. TicketAccess is hosted in a cloud environment managed and controlled by PelicanCorp. Our globally diverse Service Delivery and Operations teams support all our customers 24 hours a day 7 days a week. The systems are monitored using a range of industry best practice tools and our maintenance procedures will ensure your service experience is second to none. TicketAccess provides secure online access to activity reports providing utilities with real time data on all tickets received, responded and actioned. Online reports can be customized to suit your organization’s requirements. TicketAccess uses information within a One Call ticket to determine the response necessary. Utilities provide responses that indicate the presence of facilities or not. TicketAccess can go an extra level, determining what type of facility is potentially impacted by the work and the work type itself; and communicate instructions needed for the facility to be protected, ensuring safety of the contractor. A unique feature of TicketAccess is its communications to users and also to Utility staff. All messages and communications broadcast to the various interested parties are stored and managed within the system providing a tool for site meetings and damage investigations.